I prefer to paint out doors because I can see all the subtle nuances in color and light patterns. 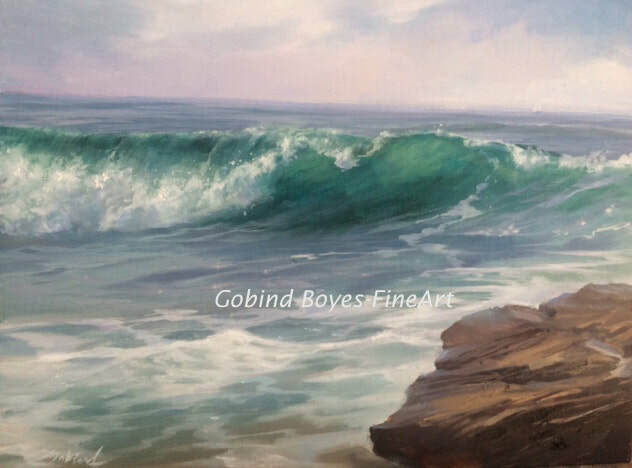 Although there are artists that seem to entertain onlookers while they paint and then possibly sell their painting right off the easel, I am reluctant to even talk . 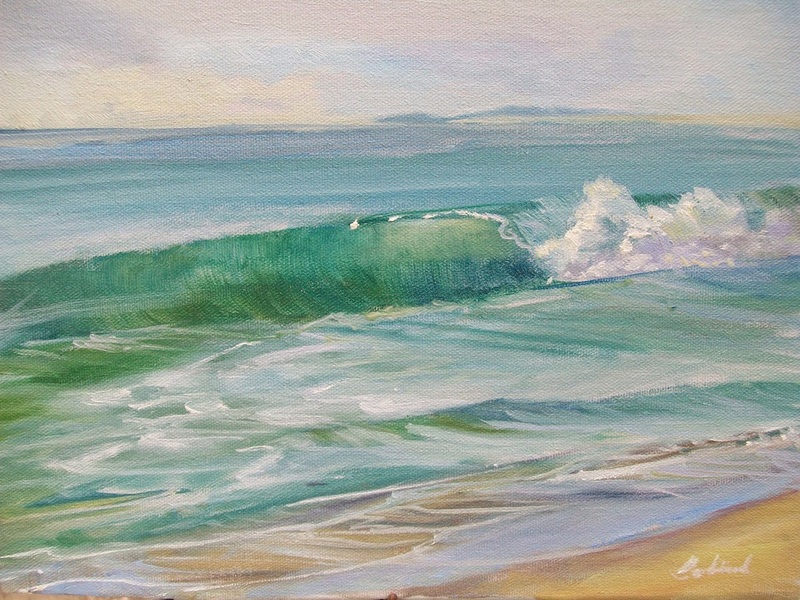 I don't mean to be rude, , it just takes my total concentration to be able to see all things out there that you like to see in my paintings. 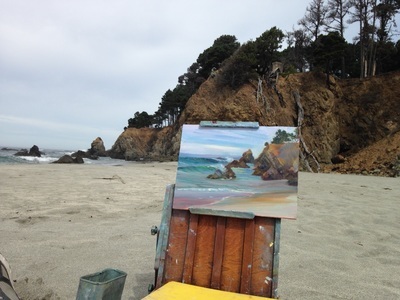 Usually I get approached right when I set up the easel more often the when the painting is almost finished. I will get comments when I have only the drawing down and maybe two swashes of color. Ussually they look pretty bad in the beginning. 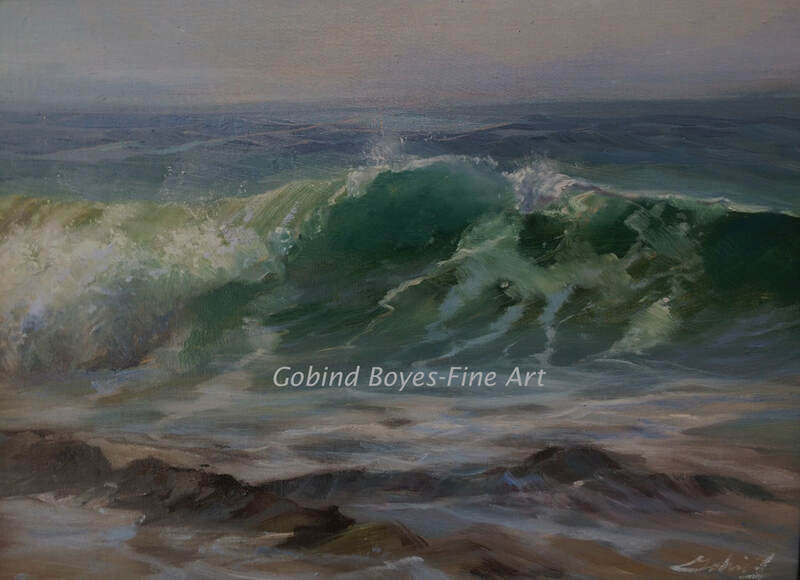 When painting a moving changing subject like I do , I am analyzing, comparing colors to each other and looking for suble changes as the light , swell and tides change. So I can't really turn my head to look at you and slap the canvas with paint while we chat. It takes careful observation and thoughtful application to make a painting. 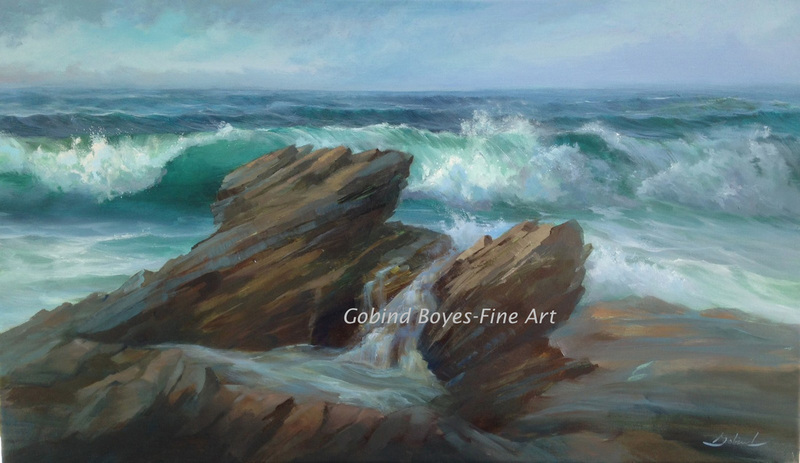 I participate in gallery shows where you can meet the artist, and this is where I love to chat. So please check out my upcoming events. 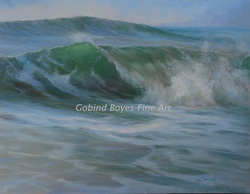 Some artists may turn up thier nose at the thought of having paintings that go with the decor of a home. But as an artist that also loves to decorate, I have do not have a problem with the idea. 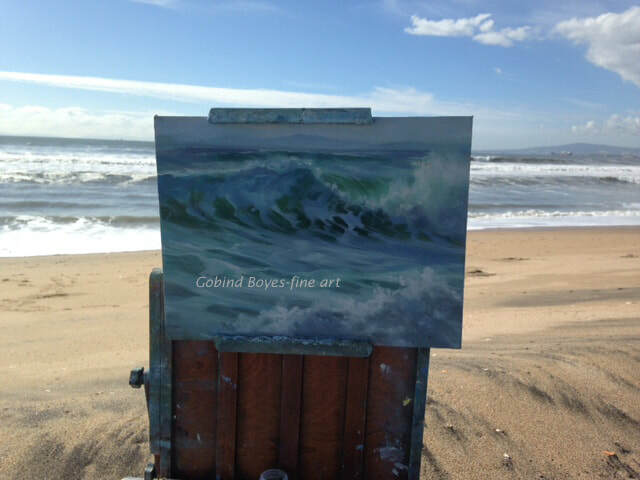 Recenlty I had someone commission a painting with the same compostion as one that I already had, but in different colors. They wanted to me to know that they had certain preferences. Your home is a place to recharge, reflect and relax. It also is a relection of who you are, your style more or less. 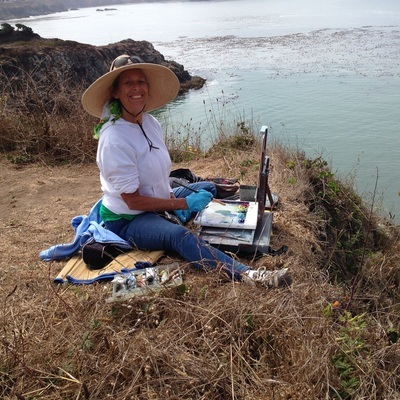 As a painter I know that my color preferences, how abstract, impressionist or realistic I want to paint are what determine my style. This is my voice as a painter. 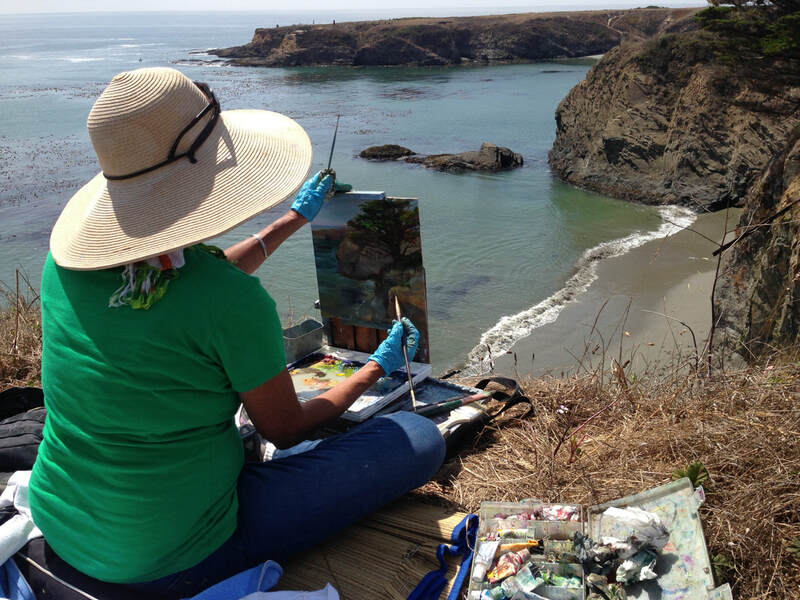 When selecting a seascape painting for your home it is okay to take into account what your style and preferences are. 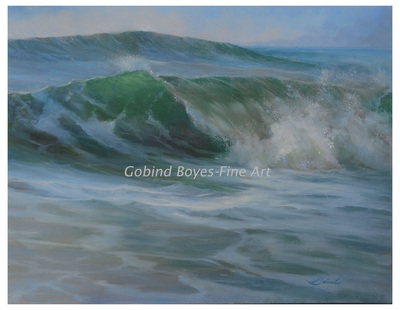 Whether you are buying art from a well known artist or not, your style should be the deciding factor in determing your purchase. You always will be happy and the painting will become another component in your home that relects you. After returning from my workshop with Glenn Villpu in Rome, I was inspired to use the elements of Rennisance composition that we studied in Roman statues and paintings. 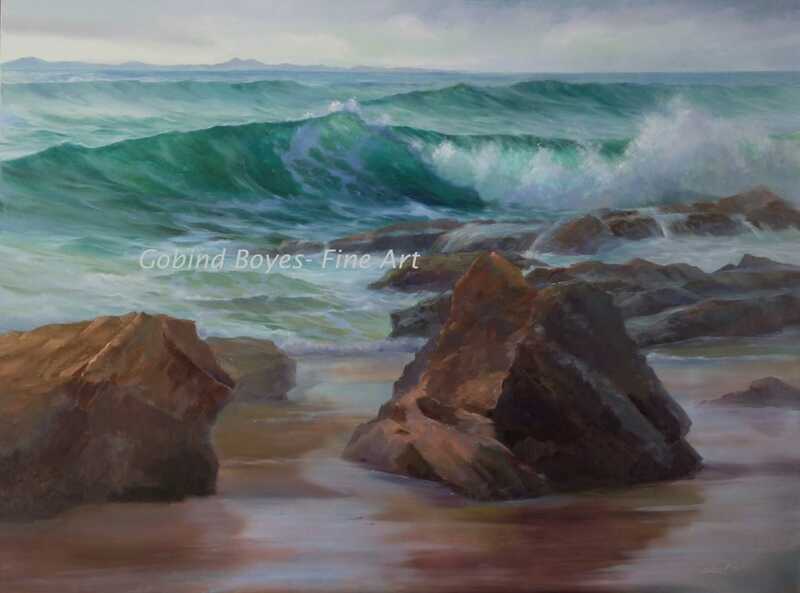 Although there are no figures in this seascape painting , rocks and the sea also have movement, structure and anatomy that are important to use when composing a seascape painting. We decided that it was time to escape the heat in So. Cal and drive up to Mendocino. There is beauty everywhere here with pine trees , beautiful beaches and quaint towns. 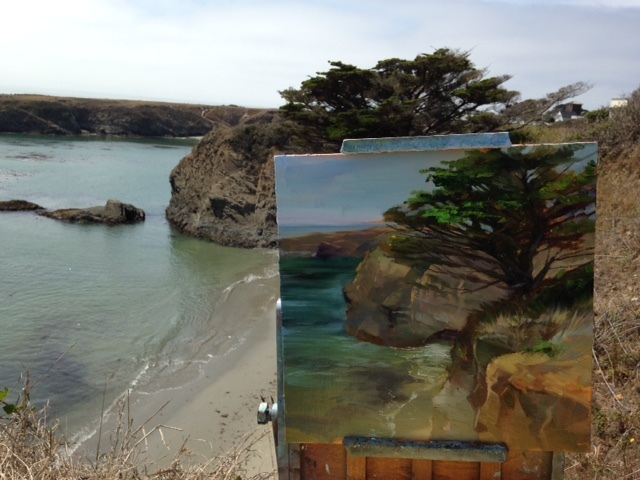 Mendocino is a painters paridise! How did I get better at painting? I was asked this question the other day. So I thought I would share with you what it took for me to get better. I don't consider myself an expert as I am still working and always trying to improve. I could have easily gone for this, but I chose another route. Yes I did go to Art School, but when I was in there one of my professors brought in an a very accomplished artist to talk to us one day. 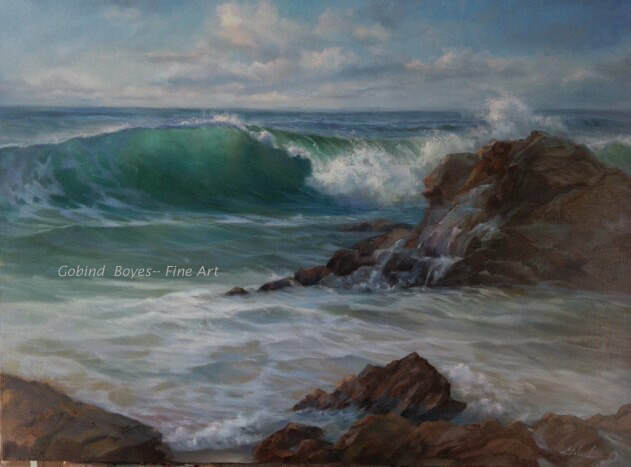 He was a self taught artist ... no art school and his works were fantastic. It was a real ego buster us art students. Here was some one who was willing to spend his time doing "small lessons" to improve until he mastered them. Whether you are an art student or you are retiring and want to take up painting, the lesson is the same. Set your ego aside. Many new painters expect to get the right supplies, have some instruction and then they will paint their master piece. Maybe you have talent, maybe not, but just like music or dance you don't do a performance right away. You start with basics and practice the steps over and over again. In music you have scales, in painting we have color charts. This is how we learn to mix color . In dance you have steps to learn before you can do the routines, routines to master before you can get to the rehersals, rehersals to do over and over until you get to the performance. In painting it is the same except you practice brush stokes instead of steps, try different compositions for the routines, do study paintings and drawings for the rehersals. Then you can finally put that big canvas up on the easel with all this reference material and do a painting. You can really cheat yourself if you think a good photo is your only reference and then you can slap paint on a canvas. It takes careful observation and conscious application to get the good results. 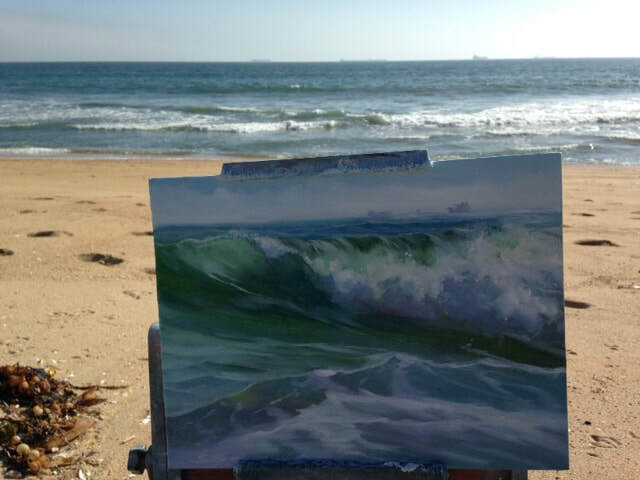 So here you have it, you can paint every day the same way that you always have or you can go back to the basics, re-learn or learn a different way. Try new brush stokes, try different colors and mix them up, be willing to draw something forty times to get right if you have to. We had a swell recently in in So Cal. It is the most exciting time to paint on location. I left the surfers out ,now the wave is available for an imaginary ride. 11"x14" oil on linen panel.